Yesterday while travelling my blackberry clicked in with news of Rumsfeld’s resignation. 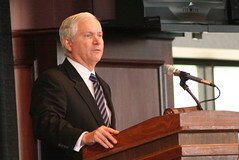 Then of the nomination of Robert Gates. Then a creative commons request by NowPublic to use a photo I took of Dr. Gates three weeks ago while at the Aggie 100 awards in College Station. These are of course very serious matters. And the Internet is a very funny place. A photo that was just a photo, because it was posted with a creative commons license and tagged, turned into a PR opportunity. Both for this flickr stream and hopefully also our company (www.schipul.com which pays the bills). So there it is. Random creative commons karma.